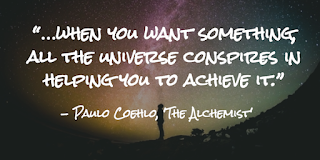 They say when you want something really bad, the entire universe conspires to make it come true.. I am standing at the brink of an overwhelming experience yet again..and this time i want to take the plunge with faith, positivity & unlimited, unconditional love.. No, i am not wanting to do it under pressure, or desperation. I want to do it , because i feel it sinking into me. It's given me a feeling i haven't felt in years..I don't know what this is.. It's a risk, a chance, or just a leap of faith. Whatever it is, i want to take it. For once in my life, i am not scared of facing something, i am only scared of not facing what it brings in. I am scared of not getting a chance to live this experience. I am scared of not giving it my complete self, before it saturates me. I am not asking my self, 'What happens if i do not grow up to love it?'. I am asking my self, "What if i kill it with my love?". I am scared of losing my sanity.. I am scared of exploding with joy! I am scared that it might not last.. I have been good to you. And have never really bothered you with many desires or wants. On the complete contrary, i have helped you fulfill a few for others. It's payback time. And since you are the bigger being, i expect you to be generous. For once in my life, i want this to happen, and i want this to be joyful and the most pleasurable experience of my life, and i want it to last. If you do not know what i mean by now, i'd like to tell you that this is making me feel like i can be complete & whole; that the fragments in me can be put into place & the rhythm in me can play a song. I need your help. I need your blessings. I need you to make it come true. 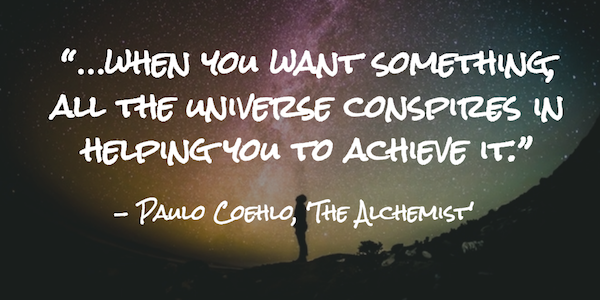 So conspire all you can. Reach out to every element that can connect us & urge them to do this with care, caution and nothing less that pure love. I deserve this, and who knows this better than you. I want this, and who understands this more than you. Before this beautiful journey is over, dear universe, make sure you complete me, so i am liberated. Thank you for your comments Anant ji. I appreciate you taking out time to read what i write. This is more of a prayer than anything frustrating. Being scared something very human and i see no harm in voicing a concern to the divinity in the universe. Thank you for your blessings. !